Designing a home with your entire family in mind can be tricky. How will a practical living room design for your toddler compromise your stylish modern taste? How will you position your furniture so that it can easily meet your family’s needs without feeling like your taste has to suffer? We have the perfect solution, with six tips for decorating your family room so that style truly does meet practicability. Read on to transform your family room into a family friendly paradise. Every put together living room, even the irregular shaped living room, looks great because of one focal piece of furniture, piece of artwork or interesting and unique wall décor such as decorative wall paneling. Do you have a framed artistic photo of your family you can center the furniture around? Perhaps you had a family portrait done that captures your family at the beach. Take this photo and turn around your entire living room theme to represent that great moment in time by decorating your family room with beach themed photo albums, sea blues and green painted walls and special scrapbooks adorning the coffee table. 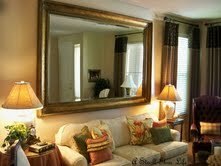 A mirror can do wonders when it comes to making your family friendly living room appear larger than it really is. It also serves a practical purpose – a place for your teenage kids, spouse and toddlers to entertain themselves before walking out of the house. Place a mirror anywhere you see fit in the home, although if your family gathers in the living room rather than any other place in the house most, it makes sense to position in here. Walls shouldn’t be looked over as just a place to hang photo frames. Think of your walls as a place for decorating your family room to your heart’s content (getting the kids involved in the process is a great rainy day activity as well, so allow them to help paint or come up with suggestions). Walls are the perfect place to put up framed mirrors, artistic decals or getting the whole family involved in painting a mural. With a family, comes clutter. There’s no way to get around the boxes of used puzzles, books, toys, DVD’s and stuffed animals that never fail to make their way from the kid’s rooms to the living room. Thankfully, there’s also a solution! Designate an area of your living room for their clutter in a stylish way so that you don’t have to ‘deal’ with their clutter in a negative way. Search out garage sales for antique chests, decorative baskets or cubbies to hang everyone’s miscellaneous items. When it comes to decorating your family room, lighting style never has to be compromised. Whether you have a family of two or eight, don’t forget about creating a stylish ambiance with creative lighting. Think about layering your lighting with colorful lamps, or even using your fireplace as a creative lighting option. Think about how your wall space is being utilized. Are you using wall mounted bookshelves to save on space? Artistic bookshelves can be purchased at your local hardware store and when installed yourself, cost the fraction of the price of a renovation project when hiring a professional. Decorate it with colors to go with your overall living room theme and put up pictures of the kids, keepsakes from family vacations – anything to make it as personal as you can! The right blend of style and practicality is a fine art to master, but possible once you spend some time considering the needs of your family. Chunky but stylish coffee tables work great with families with toddlers (as opposed to lightweight ones with glass tops) to limit accidents. Make your family room personal! By incorporating small details that make your family unique such as decorative photo frames with mats hanging from the walls or wall paper that the children helped pick out, you will always feel comfortable and so will everyone in your household. 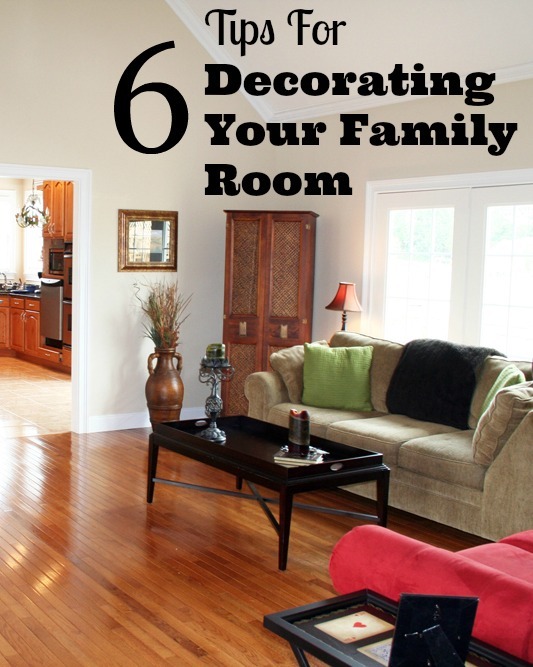 Which tips for decorating your family room are your favorite? When it comes to decorating your house, you usually can’t avoid the clutter and I love how you say to embrace it because if you might as well make the most of it. I would get new furniture to accommodate the clutter, like new shelves or small tables. Everyone has their own personal taste, so just use that when designing the room. Great information and tips!